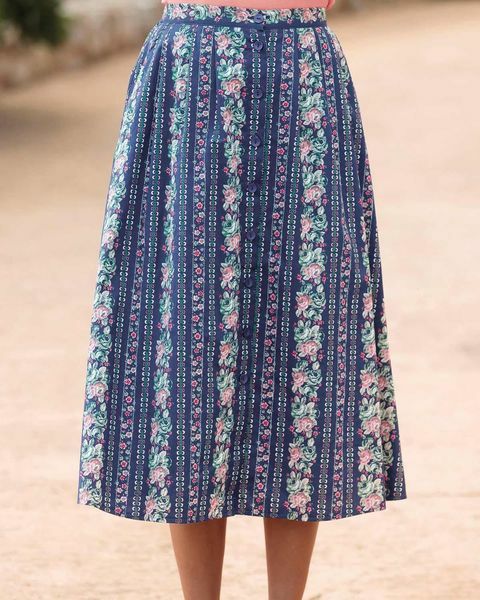 Ladies Rambling Rose Floral Skirt in pure cotton. In 27", 30"or 33". Ladies Pretty, pure cotton floral trellis print skirt in shades of coral and spruce on a mid-blue base. Button through style with soft front pleats and side pockets. Full back waist elastication ensures a comfortable fit. For a classic look coordinate with our range of knitwear and blouses.